Matt Murray started his career as a second round pick of the Braves. He later had to start over after Tommy John surgery on his elbow. But, after losing nearly two full seasons to rehabbing that elbow, Murray returned. In his third season after coming back, he was in the majors. "This is just incredible," Murray told The South Florida Sun-Sentinel after his August 1995 big league debut. "I never could have imagined this happening a year ago. I mean, I was in A ball." Murray debuted that August getting into four games with the Braves and later two with the Red Sox. But, in a career that would span 12 seasons, those six big league outings would be the only major league outings he would get. 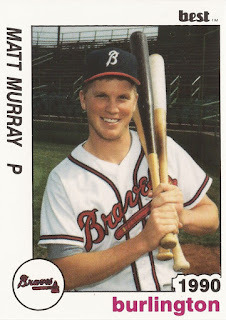 Murray's pro career began in 1988, taken by the Braves in the second round of the draft, out of high school in Connecticut. He grew up in Boston. With the Braves, Murray started at rookie Pulaski. He moved to single-A Sumter in 1989, then single-A Burlington in 1990. At Burlington, Murray went 11-7, with a 3.26 ERA. He then made high-A Durham in 1991, and blew out his elbow. He got just two starts for Durham that year, then sat out all of 1992. He then returned to the field in 1993 with single-A Macon. He went 7-3 there, with a 1.83 ERA over 15 starts. In 1994, he made high-A Durham then AA Greenville. He started 1995 back at Greenville, going 4-0, with a 1.53 ERA. He picked up his second win in an early-April six-inning effort. "I was spotting my fastball tonight," Murray told The Orlando Sentinel after that win. "I was able to move it inside and outside and I threw little else." Moved up to AAA Richmond, Murray went 10-3, with a 2.78 ERA. Then, in August, he got his call to Atlanta. With the Braves, Murray got into four games, starting one. In 10.2 innings, he gave up eight earned. At the end August, Murray was sent in a trade to his hometown team, the Red Sox. "We were looking for some pitching this year and for in the future," Red Sox GM Dan Duquette told The Hartford Courant of Murray. "He's a big, strong kid. He's got youth, size." Murray got into two games, one start, for the Red Sox that September. In 3.1 innings, he gave up seven earned. They were the last outings of his major league career. Murray played one more season in the minors, at AAA with the Phillies and Braves. He then played three more in independent ball, rounding out his professional career.